Kyosho Blizzard "Search and Rescue"
The Blizzard SR or "Search and Rescue" is based on a newly updated design of the original Blizzard chassis. Now in Ready to Run form instead of a kit version just add batteries and you are ready to hit the snow or dirt! Dual 380 motors and 2 Lipo compatible ESC's have incredible power and will drive the Blizzard wherever you dare to go! The new 380 motors have plenty of torque for climbing and powering over just about anything! The dual motor setup allows for realistic movement as each one drives it's individual track. Also new to the blizzard is the movable blade, operated from the 3rd channel on the awesome new 2.4GHz radio system. 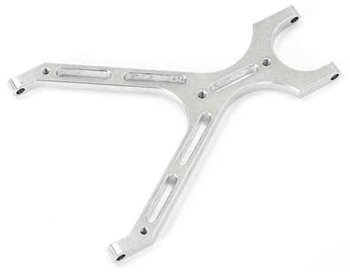 Use the blade to plow snow and create snow plowed tracks for your other RC vehicles! Great for the RC enthusiast that would otherwise let the snow get in the way of fun! Get one of these and you will be looking forward to those snow filled winter months! Inner Cover - Dust and snow proof chassis design with inner covers covering all critical areas like gears, motors and ESC's. *Not water proof! 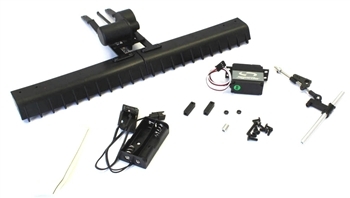 KS101BK - The Blizzard SR is equipped with a reliable KS101BK servo for the front plow. Dual 380 Motors - Two 380 size motors are pre-installed for easy control and high torque output. Realistic - Two realistic tracks are on either side of the Blizzard SR, these track give you the freedom to run on, over and though anything with ease. Ready Set - The Blizzard SR is a fully assembled kit right out of the box with little to no prep time. 2.4Ghz Radio - The New KT-21 2.4Ghz Transmitter gives you the advantage an freedom to run when and where you want with no worries. Its a cool machine. Little light in the rear with the plow on. Will add some. Metal tracks will make it better. I wasn't sure I would like the Blizzard as I live in a cold area with lost of snow and I am not big on being outside, but I find myself taking it outside every day now that it snows to try it out! It actually can plow, especially now that I got the metal tracks. These really help it dig in. I just tell the wife I going to shovel the snow!